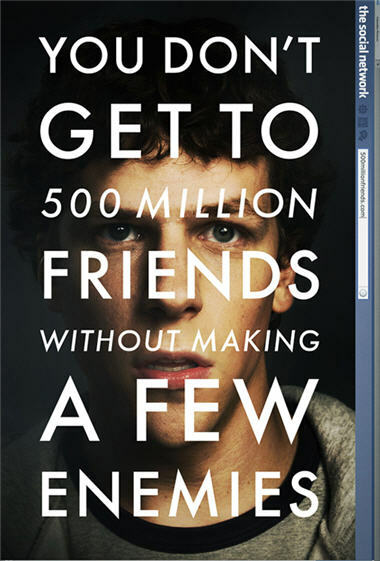 This past weekend, I went to see The Social Network, starring Jesse Eisenberg, Justin Timberlake, and Andrew Garfield. There are also appearing roles played by Rashida Jones, Brenda Song, Josh Pence, Armie Hammer, and Malese Jow. 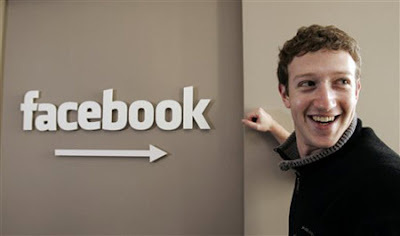 As most of you know it was all about Facebook - how it was first created and it took you through all the lawsuits involved as well. I thought it was a pretty good movie and definitely inspiring. It's amazing to see how popular the site became in just a short period of time. Although I'm sure the story plot wasn't word-for-word for each scenario that happened in real life (meaning it was mostly fiction), I think it gave viewers a good idea of the whole creation including both the struggles and success - it was quite entertaining. The movie added a few chuckles throughout as well. I remember getting an invite to join Facebook when I was about a freshman in high school (2004). At that time it was still mostly for college students, but I think they were slowly integrating high schools as well. It was still around the time when everyone was on MySpace. I created a profile but there was only about 7 other people from my school who had an account since no one was really using it yet. I remember inviting a bunch of my friends and a few years later many more people joined. I do have to say, I miss the original layout but I do like some of the newer features. But I am glad they kept the simplicity of it. Below is just a comparison of the real Facebook team compared to the actors who played them. 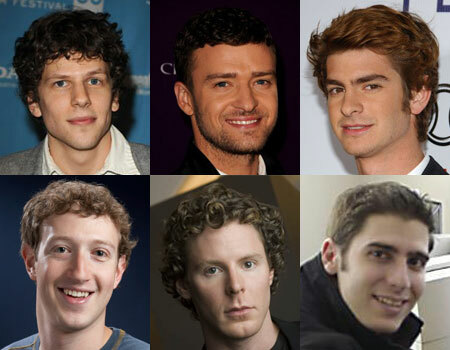 Jesse Eisenberg played Mark Zuckerberg, Justin Timberlake played Sean Parker (man who created Napster & Plaxo and then joined the Facebook team), and Andrew Garfield played Eduardo Saverin (the original CFO of Facebook). My BF rarely wants to see anything enough to go to the theatre for it instead of waiting for it to come out on Netflix. This is one of the movies he is insisting we go catch - and I agree, I am totally intrigued by the story behind it! Even if I'm not storming into the cinema, I will definitely watch it. Funny how the actors are just that BIT better looking. I'm not on Facebook and have no interest in joining it, yet this film quite intrigues me... Odd. Its sounds really interesting and I would like to see it sometime. This is on the top of my list of movies to see this Fall! thanks for sharing! might see it- but not in the cinema. hope youre having a good monday dear! i just did a review of this movie too. i also liked it. back in 2004 i was a freshman in college and that's when i got my FB invite too. there was no wall, it was still called The Facebook, and it was mainly only open to college kids. now it's open to everyone! I can't wait to see it! It sounds really good and Andrew Garfield is so attractive. I totally want to see this! The ads for it I think are kind of intense but I guess it goes without saying that producing something like Facebook has got to be intense. Love the comparison photos. So interesting! I wanna wanna see this. We will get it in two weeks here in Paris. I want to see this! The story is most definitely am inspiration. it looks so good! this post makes me want to see it even more! This is a great review. I am really looking forward to seeing this movie, especially since I keep hearing such awesome things about it! I got facebook the summer of 2005, when they finally added my college to join. Lol. Its been such a huge part of my life ever since...I once heard that today, if facebook were a country, it would be the third largest country in the world. That's how many people are on it! Insane, isn't it? Mark really changed the world...awesome for someone so young! PS. I also loved the photo comparisons! everybody who has seen this seems to really like it! Waiting for it to get here. Saw 'Date Night' on DVD and it was hilarious. I saw that on Saturday! I actually found it really interesting, excellent script. I need to check this out. Thanks for sharing. I want to watch this so so bad! It looks great.